Most men breathe shallowly from the chest. In three-part yogic breathing, air is inhaled into the lungs and sequentially fills the entire torso, beginning with the lower belly and rising up through the upper abdomen to chest, upper chest, and even to the shoulder area. In preparation for doing three-part yogic breathing, it can be helpful for you to get a feeling for how you routinely breathe. To do this, lie on your back, preferably on the floor (see Fig. 16.1). Lying on a padded surface such as a rug or blanket can provide you with some cushioning. Place a pillow or bolster under your knees and/or the back of your head to increase your level of comfort in this position. You can also experiment using a rolled-up or folded towel to support your knees or head. Breathe as you normally would: Observe your breath. If you are like most men, you are probably taking a shallow breath, mainly into the chest area. This type of breath is a shorter breath than full three-part yogic breathing, and it does not provide as rich a supply of oxygen and vital life energy as full yogic breathing. Now, place your hands on your abdomen. As you inhale, fill up the area of your abdomen and solar plexus with as much air as you comfortably can. Do this with ease, not strain. Use your hands to feel the area of your stomach rising. Now exhale. Practice inhaling and exhaling deeply into your abdomen for several rounds of breath. 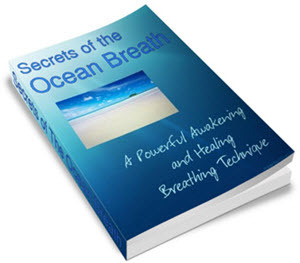 You are now practicing abdominal breathing, and you are allowing your body to benefit from drawing in even more oxygen than with shallow, chest breathing. Continue your experimentation further by placing your hands along the sides of your chest, so that your hands are covering the lateral sides of your ribs. Inhale deeply into your abdomen and allow the breath to continue to rise and fill up completely the area of your chest. With your hands, feel your ribs rising and separating as the chest fills up with rich oxygen. As you exhale, allow the breath to empty first from your chest and then from your abdomen. Feel the ribs return to their original position as the chest deflates. The abdomen also contracts. Practice several rounds of inhalation and exhalation in this manner: As you breathe in, feel your abdomen fill completely, and then your chest and ribs. As you breathe out, feel your ribs and chest deflate and your abdomen contract. Breathe slowly and rhythmically. Don't force your breath, and don't hold it, either. Finally, to complete the introduction to three-part yogic breathing, place your hands on your upper chest, below your collarbones. As you inhale, allow your abdomen to rise as it fills with oxygen. Next, allow your chest and ribs to rise and expand. Finally, feel your upper chest, all the way out to your shoulders, expand and rise. Feel your breath rise completely with your hands resting lightly on your upper chest. As you exhale, allow the upper chest and shoulders to deflate. Allow your hands to register the sinking sensation of your upper chest as it lowers to its original position. Next, allow the air to empty out of your chest as it sinks back down. Finally, let your abdomen contract as you completely expel any remaining air. Practice breathing in and out in this fashion for several minutes: As you inhale, allow your abdomen, then chest, and finally upper chest and collarbones to fill with rich, freshly oxygenated air. As you exhale, reverse the movement: feeling your upper chest and collarbones sink back down as you breathe out, followed by the sinking of your chest, and finally, the contraction of your abdomen. You are expelling from your body all the air containing the carbon dioxide and other toxic waste products that have been created by the metabolic processes of your body's cells. You are cleansing and healing yourself all the way down to the cellular level. After you have practiced this full three-part yogic breathing, take stock of the effects of this breathing exercise. How do you feel in relation to how you felt before you began your practice of this breathing technique? How does this type of breathing compare to your habitual way of breathing? Did any parts of this breathing have a special feeling to you— were they difficult to perform or did they feel particularly good to you? Make a note of any sensations and observations. Try not to judge yourself. Let your breath be your guide and teacher. Practice this full three-part yogic breathing as regularly as you can. Once you are comfortable practicing it in a supine position, try practicing this yogic breathing when seated or standing. It will help you to relax and energize simultaneously. When faced with a stressful situation, taking a short break to do a few rounds of three-part yogic breathing can help calm and still your mind so that you will be better able to deal with the cares and concerns that life might throw your way. Nadi Shodhanam, or "Alternate Nostril Breathing," is a wonderful way to restore balance—physically, emotionally, and mentally. It can help to calm the nervous system, bring clarity to the mind, and may even help alleviate breathing and sinus problems. To practice Alternate Nostril Breathing, assume a comfortable seated position. If you can, try sitting cross-legged on the floor with your sit-bones resting firmly on the ground and your trunk, spine, neck, and head erect. If this position is not comfortable for you, then try sitting in a straight-backed chair for support, with your legs uncrossed and your feet firmly resting on the ground. Let the chair or the ground support your body. In this position, also try to have your trunk, spine, neck, and head erect. A guide to the optimum posture of alignment is that a string passing through your ears, shoulders, and sit-bones would form a straight line, perpendicular to the floor. Asana literally means "seat." One of the key purposes of the practice of asanas, or the physical postures of hatha yoga, is to develop and maintain your body's strength and flexibility so that you can sit comfortably in an optimally aligned position for pranayama and meditation. Allow yourself to center for a moment. Lift your right hand in front of you. Fold your index and middle fingers toward the inside of your palm. Allow your thumb and your third and little finger to remain extended outward from your right hand (see Fig. 16.2a). The position of the hand in this way forms a mudra, or yogic "seal" known as mgri mudra. Mgri refers to "deer" in Sanskrit: When the fingers are positioned in this way, they are said to form the shape of the antlers of a running deer when seen in profile. Rest the back of your left hand comfortably on your left knee or thigh. Try touching the tips of the left thumb and index finger against one another, so that they form the shape of a circle. The fingers of your left hand are forming another yogic seal. This particular mudra is known as jnana mudra, the yogic symbol or "seal" of knowledge. Uniting the index finger and thumb represents the union of your individual consciousness with universal consciousness. This mudra helps to seal in the energy that will be circulating during your practice of Alternate Nostril Breathing. Now inhale through your left nostril. As you do so, gently place your right thumb over your right nostril to seal off the nostril. You are now breathing in through the left nostril. As you complete your inhalation into your left nostril, press your right ring and little fingers gently over the left nostril as you simultaneously release your right thumb from the right nostril. Let your right thumb rest lightly on your right nostril without applying any pressure on the nostril itself so that you can exhale fully through the right nostril. You are sealing off the left nostril now as you allow your breath to release through the right nostril, thus alternating the passage of air from the left to the right nostril. On your next inhalation, maintaining the fingers of your right hand in the position where they are, inhale fully through the right nostril. As you complete your inhalation, gently release the pressure of your right ring and little fingers on the left nostril as you gently press your right thumb on your right nostril to seal it off. Exhale completely through your left nostril. You have now alternated the passage of air from the right to the left nostril. Breathing in the manner just described—in through the left nostril, out through the right; and then in through the right and out through the left—constitutes one "round" of Alternate Nostril Breathing. You begin the practice of Alternate Nostril Breathing by inhaling in through the left nostril because the left nostril represents the channel of ida, or feminine, energy in the body. As feminine energy, this channel is considered to be receptive and so is a particularly appropriate channel with which to begin to receive the intake of air in Nadi Shodhanam. Practice as many rounds of Alternate Nostril Breathing as often as necessary until you become comfortable with it. If you are a beginner, practice three to five complete rounds of Alternate Nostril Breathing. If you are more advanced, practice 10 to 20 or more rounds. If you find that there are certain days when your sinuses are particularly congested or you have difficulty breathing through one of your nostrils, then skip the practice. You may be pleasantly surprised to discover, however, that if you do have some breathing or sinus problems, a regular practice of Alternate Nostril Breathing might help to alleviate them. Alternate Nostril Breathing helps restore and balance the entire body. It helps to harmonize the right and left hemispheres of the brain, and the masculine and feminine energies that reside in each man. It helps to calm the nervous system, and can be just the perfect technique to use when faced with stress. Because it helps to bring oxygen to the entire body, it is also energizing. Practicing a few rounds of Alternate Nostril Breathing may be just what you need to recharge yourself during a moment of lagging energy during the day. The yogic technique of kapalabhati, or "Lustrous Breath," is an extremely energizing and vitalizing breathing technique. It brings a great volume of oxygen into the body in a short period of time, helps to warm and invigorate the vital organs, and aids in circulating blood quickly throughout the entire body. In preparation to practice Lustrous Breath, assume a comfortable seated position as described in "Alternate Nostril Breathing." Allow your hands to rest gently on your kneecaps, thighs, or in your lap. Take a few deep breaths to center yourself. Now, as you breathe through your nose, contract your abdomen as you exhale. Press your navel toward your spine as you expel whatever air is in your abdomen. (See Fig. 16.3.) As soon as the air is expelled, let your abdomen relax as your body naturally inhales fresh air. Then exhale once again as you contract your abdomen. Let your emphasis be on the quick, rapid, and forceful (but not forced or painful!) exhalation of air from your abdomen. Your abdomen flattens as you compress it on the exhalation, and the air naturally fills it again as you inhale. Continue exhaling and inhaling in this manner. The rapid contraction and filling of your abdomen as air is expelled and inhaled creates a type of pumping motion. If you have difficulty practicing Lustrous Breath, you might imagine that there is a feather resting on the top of your nose and you are trying to blow it off, contracting the muscles of your abdomen to initiate the exhalation. As you exhale, compress your bellybutton back toward your spine. As you practice this breathing technique, you may want to have a handkerchief or some tissues at hand. You may find mucous secretions being more actively released from your nose on your forceful exhalations. Lustrous Breath has the added benefit of helping clear and cleanse the nasal passageways. When you first begin to practice Lustrous Breath, try doing 20 to 30 Lustrous Breaths at a time (one active exhalation followed by a spontaneous inhalation constitutes one Lustrous Breath). Pause and rest. Then try some more. With experience, you will probably find that you can increase the period of time and numbers of inhalations and exhalations that you can accomplish without feeling fatigued. Lustrous Breath can be particularly invigorating and energizing. As you experiment with it, see what effect it has on you. How do you feel after a round of Lustrous Breath repetitions? How do you feel relative to how you felt before you began this breathing practice? Are you aware of any difficulties or pleasurable effects that you experience as a result of this practice? As your day progresses, are you aware of any changes in your level of energy?